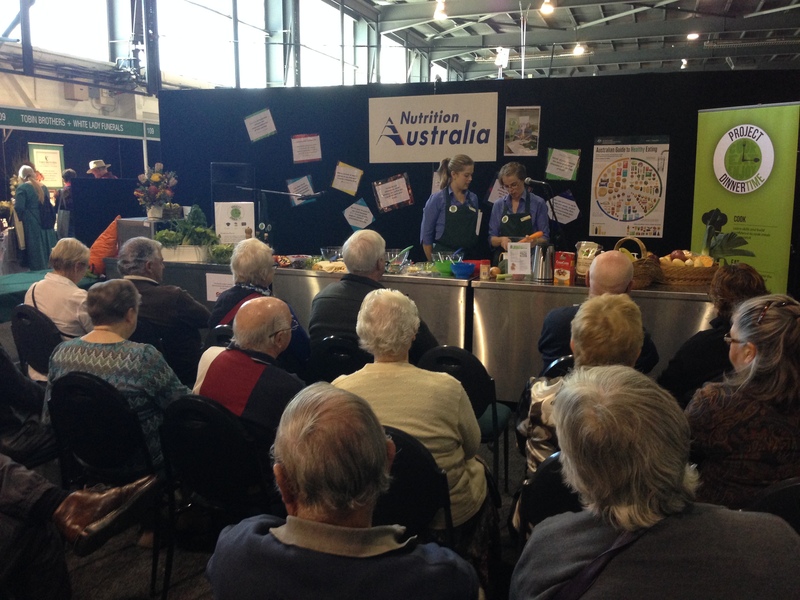 The team from Nutrition Australia ACT (NA ACT) were given a wonderful opportunity to inspire healthy eating at the recent Retirement, Lifestyle and Travel Expo held in Canberra on 16-18 May. Using a custom built kitchen stage, NA ACT Dietitians and home cook extraordinaires Kasey and Leanne, demonstrated a range of healthy dishes on each of the three days. A total of nine different recipes were demonstrated, focusing on important nutrients for ageing including calcium, fibre, healthy fats and antioxidants. Favourite dishes were creamy mushroom risotto, vegetable curry and salmon cakes with a spiced yoghurt dressing. At each lunchtime cooking demonstration, Leanne and Kasey teamed up with entertainers Frankie J. Holden and his wife Michelle Pettigrove who both contributed some great tips and culinary ideas, alongside lots of laughs and fun. “It was a great opportunity to inspire people, using new ingredients and cooking skills that may be less familiar to this population group” said NA ACT dietitian Leanne Elliston. Unique cooking techniques, such as those used to create basic stir fries, curries and risotto, were also welcomed by the audience who went home with the recipes and motivation to get cooking in their own kitchens. Special thanks to the ACT Government Community Services Directorate for supporting NA ACT at this event. The majority of the food used was kindly donated by Costco. Come and cook with us! If you need inspiration and motivation in the kitchen then look no further than the Project Dinnertime – Simple Eats for Seniors Program. Simple Eats for Seniors is a three week hands on cooking and food skills program, designed to inspire and motivate seniors in the kitchen with a focus on achieving their nutritional requirements. Call NA ACT now to book or find out more on 6162 2583.